If you are a visitor to the charming state of Georgia, plan a unique ghost-hunting adventure and stay at one of Georgia's historic haunted hotels. And if you are a resident of Georgia, get to know your state's spookier side and embark on an exploration of the unexplainable and visit one of Georgia's very own haunted hotels. One of its most haunted hotel is the historic 17HUndred90 Inn, in Savannah, that is home to several ghosts, one who has a keen dislike of the female persuasion. The genteel South is the setting for this charmingly quaint inn, the 17Hundred90 Inn, Savannah's oldest and most haunted inn. It is also home to a legendary ghost by the name of Anna Powers. She is said to be haunting the inn since her demise in the early 1800's. However, it's not only her spirit that is reported to be haunting the inn. There are five other spirits! The usual story that is told during most of Savannah haunted tours is that poor Anna threw herself outside her bedroom window once she realized that her husband has been having an affair, Well, we have recently visited the 17Hundred90 and have discovered the real scoop! We were told by one of the workers, who had an experience with Anna via a medium that she was actually pushed out of her bedroom window (left) to the brick courtyard below by Anna's husband's mistress. Since then Anna's spirit has not been especially kind to the inn's female guests. Some female guests - who happen to be sleeping on Anna's side of the bed have been kicked off the bed landing on the floor (below). And in Anna's bathroom, female guest have found their make-up either missing or moved! Most of these guests end up checking out of Anna's room 204 pretty fast. Our inside source has told us is that he has literally seen the apparition of Anna herself. Our source also reported another interesting experience involving Anna. Once a couple had used a Quija board to try to contact Anna. Well, this seemed to really tick her off. When Anna gets irritated or angry she uses the electric energy of her old bedside lamp to vent! (right) The lamp flickers on and off. As well, the energy on the side of the room where she was attacked and thrown to her death tends to register a heavy energy. The other side, is a lot more "lighter." Now, Miss Anna Powers does not bother everyone. Some guests leave upset for not encountering Anna's presence. However those that do - usually end up requesting another room for the rest of their stay at the inn because they are that spooked. Another reported ghost is that of a female chef - a picture was taken of her reflection in the restaurant's window, that is why they suspect it is a female chef. So not only is room 204 haunted, the inn's restaurant itself experiences it own fair share of ghostly mischief (left). Dinner tables tend to get rearranged by themselves and candles light spontaneously. Some waiters experience their food trays getting knocked over for no apparent reason. Some have even seen tables move on their own. Another reported ghost is that of a little boy. He tends to run up and and down the hallway between room 201 and 203 (right). A man from room 203 once called to complain of a child laughing and running up and down the hall. However, the manager informed the man that no child had been registered as a guest. Apparently, the young boy died from a fall while running through the halls. He apparently fell and hit his temple fatally. The other two ghosts were two previous maids. They make themselves known by moving maid carts right in the middle of hallways. So what's the big deal? Well, keeping a maid cart in the middle of a hallway is against the inn's policy. Not only is it a fire hazard but hotel policy is strict that maids keep their carts against the walls in order to avoid possible injury and lawsuit. Gratefully we would like to thank our source, Glen Hurst (left) one of the best innkeepers in Savannah, who was so very kind to not only tell us the real scoop about Anna Powers, but also to give us a personal tour of Anna Power's room and the hallway where the little boy roams. We are grateful to be able to publish the pictures we shot on our site. Once again, thanks Glenn, you were the perfect Southern Gentleman and ghost aficionado! We hope to see you again soon! 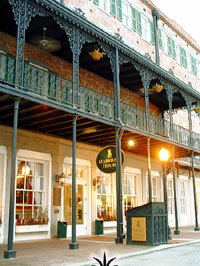 In the year 1851, the beautiful and charming Marshall House was the first hotel to be built in Savannah. Located in the historic downtown district, the Marshall House didn’t always serve as a hotel. It was once used as a hospital during the Civil War and twice during times of yellow fever epidemics. It is well known that Savannah is considered one of the most haunted cities in America. And because the Marshall House has a long history- enduring a war and several epidemics - it isn’t surprising that it also has a very lively and active ghostly presence. In 2005, the Marshall House was even featured on Travel Channel's Haunted Hotels. 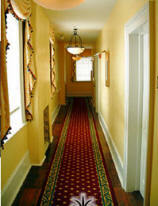 Both guests and staff have reported seeing ghosts in the hallways and the foyer. When no children were registered at the hotel, guests could hear the sound of children running up and down the hallways in the early morning hours. A few guests claim that someone or something was holding onto their wrist - like a nurse feeling for your pulse. Loud crashes coming from the 4th floor hallway in the early morning. Toilets suddenly overflowing for no apparent reason, hence not when in use! One account involved a woman and her daughter. The toilet started to overflow on its own. They used some towels to soak up the water and then called maintenance. However, when maintenance arrived, they found only two baffled guests: When the mother went back into the bathroom to see if the overflow had stopped, it not only had stopped but the towels and the floor were dry! While a guest was watching TV one night, he suddenly heard water running in the bathroom. He got up to check and found the bathtub faucet had mysteriously turned itself on. A guest heard the door knob rattling as if someone was trying to enter the room. However, upon looking through the peephole, no one was there. The sound of a woman walking with high-heels heard overhead from room 205. The only glitch: the guest in the above room, room 305 were not in at the time. The Marshall House is aware of their reputation. In effect, they now offer their guests a Haunted Hotel package. It consists of two night’s accommodations, two tickets to either Savannah’s Walks or Oglethorpe Trolley Ghost tour, a copy of David Rousseau's book, “Savannah Ghosts.” The Marshall House claims their ghosts are of the friendly persuasion only! The historical Jekyll Island Club Hotel is a four-star, grand Victorian style hotel offering world class amenities, southern hospitality, ocean vistas and even some ghosts. Considering the hotel first opened its doors back in 1888, that amount of time and history had to have acquired the hotel a ghost or two. There are reports of several ghostly activities at the Jekyll. The first ghost is thought to be that of Samuel Spencer (left), president of the Southern Railroad Company. He must have either lived at the hotel or was a frequent guest because he had developed a morning routine of having his morning coffee while reading the Wall Street Journal. Unfortunately and ironically, he was killed in a train accident in 1906. Ever since then, those who stay in “Spencer’s Room,” find their delivered newspapers disturbed, moved or even folded in their absence. If a guest briefly left the room for a shower or errand, they find their coffee cup poured for them or even sipped on when they return. Apparently some habits or rituals die hard, even for ghosts. Another ghost is thought to be that of General Lloyd Aspinwall, one of the Jekyll Island Club’s founding members. Before the club opened, he was appointed to be its first president. Unfortunately, Aspinwall never had that pleasure because he died unexpectedly on September 4, 1886 – a year before the club opened. Letters dated from later years reveal that some club members had actually seen Aspinwall’s ghost, with his hands clasped behind him walking the Riverfront Veranda around dusk on September 4th! 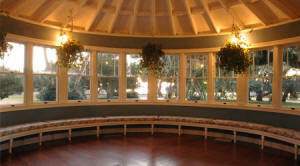 The veranda today is a sunroom honoring Aspinwall calling it Aspinwall Room (above). A third ghost is believed to be a former bellman, dressed in 1920’s attire. He likes to knock on the rooms of newlyweds, offering the bridegrooms freshly laundered and pressed suits. The ghost’s activity seems to occur mostly on the second floor. No one seems to know what his name was in real life. 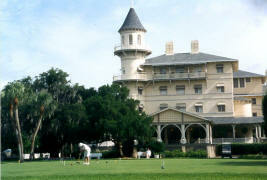 One of the Jekyll’s buildings is called the Sans Souci, which was originally built for its hunting club members in 1896. A member by the name J. Pierpont Morgan used to sit on porch of his third floor room and have an early morning cigar smoke. Nowadays, guests who rise early can still smell his cigar. The Jekyll Island Club also offers murder mystery weekends for the sleuth junkies out there. Firstly, you have to find the hotel. “Jekyll Island” sounds spooky & mysterious by name alone, but for those undeterred, Jekyll Island is located midway between Savannah and Jacksonville, Florida. You need to take the Jekyll Island Causeway to reach the hotel and town. 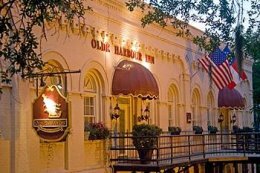 The Olde Harbour Inn, located right on Savannah’s famed cobblestone-lined River Street is one of the oldest inns in Savannah’s historic district. Its stone foundation was first laid back in 1812. It went through several transformations; it was once a cotton warehouse, as well it also experienced several fires. It was due to one of these fires that they suspect the Olde Harbour Inn’s spirit came about. Legend has it that the the Olde Harbour Inn is haunted by a spirit affectionately name “Hank,” once an employee when the inn was a cotton warehouse. Hank is probably not the spirit’s real name as the employees today do not know the specifics of this person who perished in one of its fires. Apparently Hank seems to mostly focus on room 406, but sometimes makes his presence known in rooms 308 and 309. One of the inn’s employees, Sherry Hughes had her own experience with room 406. One night while she slept in room 405, the alarm clock in 406 suddenly went off. After checking with the front desk, nobody was even staying in room 406. Sherry says, “It could have just been that it was an alarm going off that was set," Hughes said. "But I thought it odd after midnight that an alarm was going off and the radio was just blaring. That kind of creeped me out, especially with 406 being the room that (Hank) tends to be in the most." To test the ghost theory out, Sherry and her husband stayed in room 406. She says she was just about to fall asleep when she heard a clicking noise at the door. She thought someone was trying to get into the room, so she woke up her husband. "As he was walking down the hallway, he saw the deadbolt turning and it was making a click-click-click sound," Sherry reports. "By the time he got to the door, there was nobody there and (the noise) had already stopped." Objects being moved on their own accord, even mysterious coins falling out of nowhere. The Olde Harbour Inn enjoys their famous spirit and its guest services offers ghost tours highlighting all the famous haunts in Savannah. We love their spirit!